The mobile app development industry is highly diversified; there are things which are obviously drastically different from each other and there are things which usually stay out of the spotlight but matter a lot. We already talked about the mistakes developers make. And now let’s take this approach differently and talk about habits only top developers, top programmer and top coders have. Usually we define a ‘good’ developer as someone who delivers on time, does quality work, work effectively with teams and have ability to be a leader. However, there are tons of smaller things that could make a big difference. 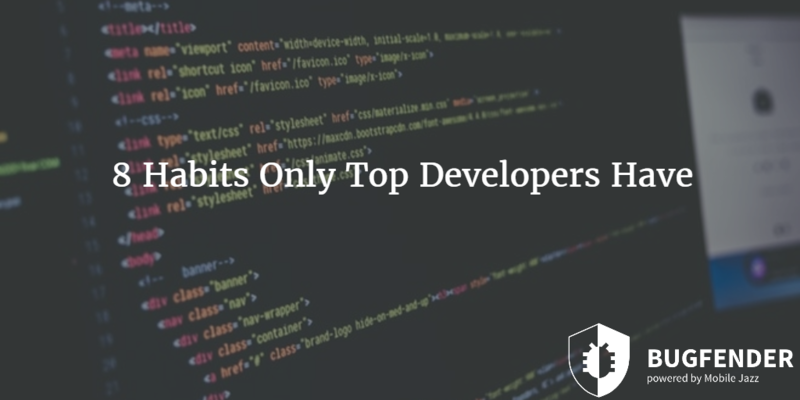 Let’s see some habits only top developers possess. Writing code is one thing, and making that code run effectively is another. You can be confident about a code or piece of software just by testing it in different situations and on different devices. We are not talking about beta testing or some other kind of testing you do at the end of project. We are talking about testing that you should do during the project to catch bugs earlier than usual. 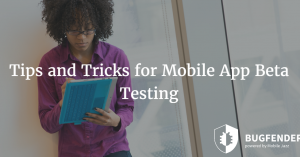 No doubt, frequent testing can help you detect issues in your app’s functionality at earlier stages that leads to lesser expensive fixes and of course it helps developers avoid total failure or chaos. Automated unit testing is a suitable and efficient way to find bugs in your development projects at early stages. Prototyping is an underrated aspect of mobile app development and developers should use this approach more often because of its obvious benefits. Of course working on a prototype when you can work on the actual project seems like a waste of resources but prototypes help clients, stakeholders, developers and everyone else involved in the process understand the final product and its features. We discussed the importance of documentation in another post earlier, and that’s where top developers make a huge difference and take a lead on everyone else. The documentation should be completed even before a single line of code is written. The main purpose of documentation is to ensure all parties are on the same page and want the same thing. If you are working for a client then make sure you get his instructions and goals in written form. You don’t have to write everything from scratch, there is ton of already proven code available on online directories and repositories. Using that code not only saves lots of efforts but it is also time efficient in terms of coding and testing. Additionally, you shouldn’t feel ashamed if you are failing to address a problem. There are numerous online communities and forums where you can find decent help for your development projects. Almost all of the mobile apps start with just an idea and after the process of refining, (that could take time and iterations) it becomes a goal that should be crystal clear. If you haven’t decided what your end goal should be, there you are actually working aimlessly on a project that you don’t even know about. First you must have an idea (that’s how you begin app development) and then you should refine that idea into a vision. Vision would become a goal when you visualize the final product and the last yet most important step is defining objectives. You might experience trouble while moving toward your end goal and in some cases you will be forces to change that goal but the important thing here is having a goal at all cost. Now that is something that could define you what type of developer you are going to be in the future. A good code not only does work on the machines but it also does work for other people as well as for the future version of you. 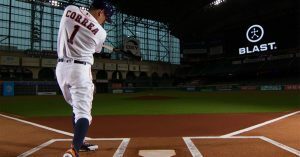 You can get the job done even with a sloppy and inefficient version of the code but that is not something you could possibly rely for a long time period. Not to mention, this technique and behavior could work on smaller projects but when you get bigger, you think bigger and try to develop bigger apps, there is no room for such behavior. Top developers write human-friendly code that they could understand later too and make the debug process a lot easier. Human-friendly code refers to well structured and self-explanatory code. As mentioned above, you should break down your vision and goal into objectives. Segmentation is an important part of mobile app development as well as for every other job in the world. If the idea doesn’t make sense, break it down into smaller digestible pieces so you can understand it. Segmentation not only helps developers understand complex ideas but it also helps them keeping track of the progress. This way you can easily see which approaches are not working well for you and where you need improvement. From the programming prospective, this technique help you debug your mobile application way faster and way easier because you already know which part is causing the trouble. Unfortunately, many times developers are forced to work under tight deadlines. However, statistically this rushing does not help in any sense at all. First of all, it develops unnecessary pressure on people that means they would not be working at their 100% capacity. Second, by moving too quickly, chances are developer is going to miss something important that could consume excessive amount of resources when discovered later. Third, rushing might help reduce the overall time spent on the development phase but it would increase the time spent on testing and debugging drastically because of the obvious reasons. Always take your time and try to get things done the right way. Based on your natural programming capabilities, there are things you can do and there are things you can’t. However, you can always use smarter tools in smart ways to get things done more efficiently and more effectively. Bugfender is a state-of-the-art remote logging tool and service that allows developers to find bugs on different devices remotely. In other words, you don’t have to have the device on you to check whether your app works fine on it or not, so you would be able to check erros and even give a better customer support. How to Become An Efficient Programmer? 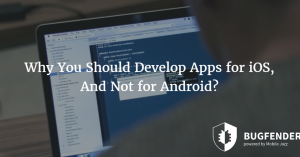 Why You Should Develop Apps for iOS, And Not for Android? as_eye-d Created with Sketch. as_safedome Created with Sketch. as_aimail Created with Sketch. as_websummit Created with Sketch. as_menshealth Created with Sketch. as_disney Created with Sketch.